Near where I live, there are a lot of wild olive trees. With oil being a problem to store for long periods, I decided to build an olive press. It should also work for apples, grapes and other fruit. It was simple to make, I started with a hydraulic jack I found in a garage sale. The press is now finished and ready to use. As soon as I finish testing it, I plan to have it powder coated to keep it from rusting. 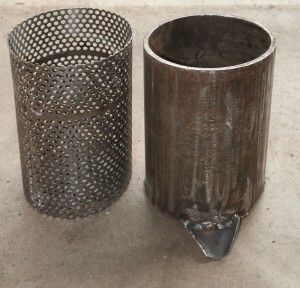 The bucket and perforated liner removed from the press, notice drain where oil comes out. My son and I put it together out of scrap materials in his shop. We made a simple metal framework and a removable bucket with a perforated liner. The oil or juice runs out the bottom of the bucket into your container. If you are pressing olives let the crushed olives drains until the oil stops flowing. You can then remove the container of oil. Replace it with a new container and pour water through the bucket. This will get more oil out. The oil will rise to the top of the water and can be easily separated. Press with bucket removed. The reason the jack is on the bottom instead of the top is that most hydraulic jacks will not work upside down. The History of US Military Rations. This entry was posted in equipment, food storage and tagged fruit press, Howard, olive oil, olive press. Bookmark the permalink. Does the perforated basket fit snugly inside the bucket? And the fixed plate on top fits snugly inside the perforated basket? How much travel does the bottle jack have? Keep us updated on the test results. 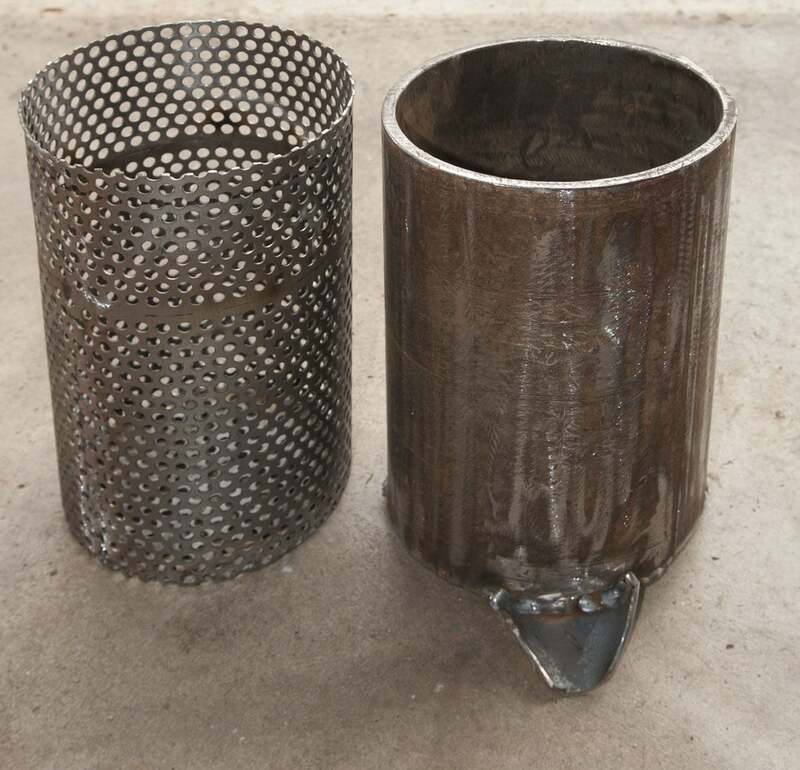 The perforated bucket has about 1/16 inch clearance, the fixed plate fits snugly in the perforated basket. The jack has enough travel and adjustment that the fixed plated can go clear to the bottom. That is more than it needs. I will post more as we use it. Now that is one serious press! Nice work, I love it. Can’t wait to hear how it works. What prevents the product from getting past the piston and coming out of the top. The piston that goes into the top of the bucket is fairly tight fitting so not much product can get by it, an the oil run out the bottom of the bucket and down the drain into a container. very nice design i love it very much.